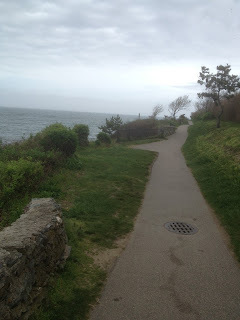 Bill & Lisa's Sporting Life: BILL AND LISA VISIT NEWPORT, R.I.
After our round at delightful Port Judith. 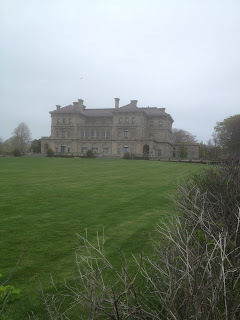 we journeyed along the coast to historic Newport. We did not have time to tour the magnificent mansions that are the city's hallmark, but did manage to hike the Cliff Walk Trail which features striking vistas of Newport Harbor to the west of the trail and the backyards of the mammoth homes to the east. With the brisk sea breeze and mist in the air, Lisa and I felt transported to Scotland's Firth of Forth. The most imposing of the breathtaking Gilded Age homes found along the trail is "The Breakers," shown below. 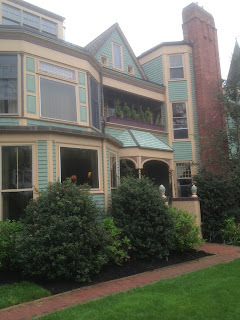 We had good luck with our B & B in Newport. The Ivy Lodge was happily situated close to the attractions and restaurants, while at the same time offering a peaceful and secluded respite on the tree-lined Clay Street. Darlene, the innkeeper, made us feel most welcome. When we entered the lodge's front door, we were blown away by the 33 foot high oak-paneled hall. Our quarters in the "Victorian Room" proved to be sumptuous. We were tired from our full day, but eagerly anticipated our 8:30 game with the Donald Ross Society at Newport Country Club on May 8th.